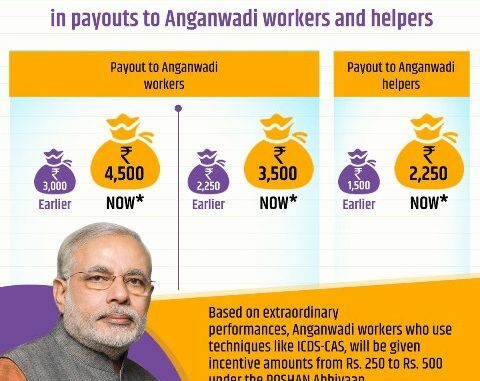 Prime Minister Narendra Modi today announced significant increase in the honorarium of the Anganwadi workers. As per the official release from the PMO Anganwadi workers now receiving Rs3000 as remunaration will get Rs4500; similarly remunaration of Rs2200 has been increased to Rs3500 and Rs1500 has been increased to Rs2250. About 27 lakh Anganwadi workers engaged in the service of child development in rural India will receive the increased remuneration from next month, mentioned the statement. The PM made this announcement during his video interaction with the ASHA workers, Anganwadi Workers and ANM (Auxulary Nurse Midwife) from across the country today as the country is observing this month as Poshan Maah,or Nutritution Month. Prime Minister recognised the contribution of grass-root health workers and thanked them for their efforts in building strong and healthy nation. He said, the Team Three-A ASHA, AWW and ANM are playing an important role in making strong the foundation and the future of the country. He appreciated their afforts and dedication for effective implementation of the Mission Indradhanush and for providing vaccination cover to more than 3 lakh pregnant women and 85 crore children.During the interaction, Prime Minister urged to spread further information about Surakshit Matritva Abhiyaan. Highlighting the National Nutrition Mission, PM said that ‘Poshan Abhiyaan’ launched from Jhunjhunu in Rajasthan, targets reduction in incidence of stunting, anemia, malnutrition and low birth weight. He added that it is essential to involve maximum women and children with this movement. PM said that the Government has focussed on aspects relating to nutrition and quality healthcare. Vaccination efforts are progressing at a quick pace, helping women and children in particular. PM also acclaimed the success of Newborn care, which benefits 1.25 million children of the country every year. It has been renamed as Home based child care under which the Asha worker will visit 11 times in first 15 month in place of earlier 6 visits in first 42 days of birth. PM highlighted the link between the health and the growth of the nation; he said if the children of the country are weak then its growth would also slow down. For any infant first thousand days of life is very crucial. Nutritious food, dietary habits during this time, decide how its body will become, how it will be in reading and writing and how strong it will be mentally. If a citizen of the country is healthy, no one can stop the development of the country. So, in the initial thousand days, efforts are being made for developing a strong mechanism to secure the future of the country. It is also noteworthy that according to WHO report, use of toilets under Swachh Bharat Abhiyan has potential to save 3 lakh innocent life. Prime Minister also mentioned about the first beneficiary of Ayushman Bharat, baby Karishma also famous as Ayushman baby. He added that she has become the symbol of hope for more than 10 crore families who are going to benefit by launch of Ayushman Bharat from Ranchi on 23rd of this month.